1. Beat together the cream cheese, granulated sugar, and egg until smooth. Stir in the chopped chocolate pieces. Set aside. 2. Adjust the rack to the center of the oven and preheat to 350°F (175°C). Butter a 12-cup muffin tin, or line the tin with paper muffin cups. 3. In a medium bowl sift together the flour, brown sugar, cocoa powder, baking soda, and salt. In a separate bowl, mix together the water, oil, vinegar, and vanilla. 4. Make a well in the center of the dry ingredients and stir in the wet ingredients, stirring until just smooth. Stir any longer and you will over mix the batter and end up with less-than-tender cupcakes. 5. Divide the batter among the muffin cups. Spoon a few tablespoons of the filling into the center of each cupcake, dividing the filling evenly. This will fill the cups almost completely, which is fine. 6. Bake for 25 minutes, or until the tops are slightly golden brown and the cupcakes feel springy when gently pressed. These moist treats will keep well unrefrigerated for 2 to 3 days if stored in an airtight container. Black Bottom Cupcakes Recipe © 2004 David Lebovitz. Photo © 2004 Christopher Hirsheimer. All rights reserved. All recipes and photos used with permission of the publisher. The decadent addition of chopped dark chocolate to the sweetened cream cheese filling is a brilliant one. The filling is creamy and dense, the cake surrounding it is deep dark chocolate. What’s not to love about these Black-Bottom Cupcakes? The ingredients are easy to find. These little gems have something for everyone. They are sophisticated enough for grown ups, gooey enough for kids, they travel well to picnics or potlucks as they are meant to be beautiful on their own. There’s no need to frost these. Go make some right now! These will make you very happy. I came across this recipe while searching for cheesecake on the site. We had perishable homemade Neufchatel cheese in large quantity and cheesecake seemed the perfect solution to use it up, until I spotted this option. Starting with the positive, they were quick and easy to put together. Lebovitz calls for no hard-to-find ingredients. He even benevolently offers the option of regular or reduced-fat cream cheese, and our homemade Neufchatel fell perfectly into the latter category, as well as either bittersweet or semisweet chocolate. 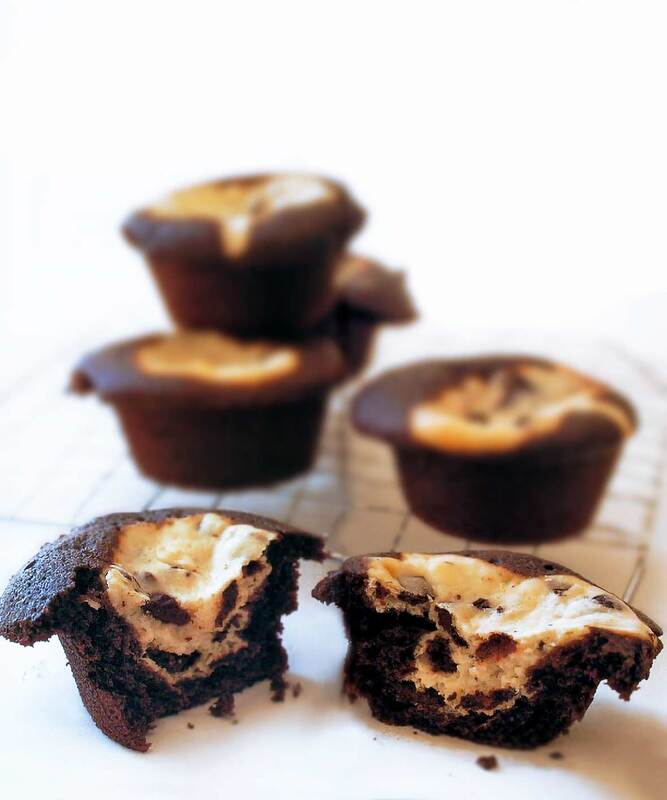 Black-Bottom Cupcakes were perfect for dessert on a cold January night, rich, delicious chocolate and cream-cheesy filling melding happily together. They were surprisingly not at all too much—the chocolate and cream cheese balanced each other, and the result was rich, but not cloyingly so. For those not generally interested in cake for dessert, consider these. They held interest through to the last bite, in part because of the variety of textures—the chocolate cake followed by the cream cheese filling and then the chocolate chunks mixed into the filling, happily better than the current cake plus too much frosting cupcake trend. As a final note, I’d add that these are ideal for anyone feeling a little cupcake-fatigued. They take standard chocolate cake and chocolate chunk cheesecake flavors, bring them together for a classic combination that will stand the test of time, far more than some of the trendier variations being created and marketed en masse at present. They were not the prettiest cupcakes ever—mine looked much like the accompanying photograph, and, to me, part of their charm was this charming homemade look coupled with their undeniably yummy taste. Marcella, nothing is wrong with Dutch-processed cocoa, it’s more a matter of acid levels. Natural cocoa is more acidic, and Dutch-processed has been treated with an alkali solution so that it’s neutralized, and has a milder flavor. If you can’t find natural cocoa, go ahead and use the Dutch-processed. There will be some slight differences, but mostly in flavor. Let us know how it turns out! My tween and her friend made these last night. Easy enough for kids to do, amazingly tasty for ALL ages! Hi Ltana28, did you make any substitutions at all? Like using Dutch-processed cocoa or another kind of oil? I’ve made these, too, and they were always fantastic, never greasy. We made these using canola oil, and they were fine. (Actually, they disappeared very quickly.) Perhaps you mistakenly added more than the 1/3 C. of oil called for. It is so easy to put the wrong amount of something in when quickly reading through a list of ingredients. I hope that you give this recipe another try at some point. These are really easy to make and the cupcakes are really very good. Far too easy to eat. My grandmother use to make these…they are delish! So glad I found the recipie again, as I lost mine. She use to make them in the mini cupcake size though….Thanks David for sharing! Both David Lebovitz and I are thrilled you found the recipe. I hope they come close to your grandmother’s. Happy holidays! Hi, thank you so much for posting this recipe, I a question.. Can I make it with olive oil? Thanks. Hi Samantha, you should be able to substitute olive oil in equal parts for vegetable oil in most baking recipes. That being said, we didn’t test these cupcakes using olive oil so can’t tell you for sure how the olive oil might affect the flavor or texture. Please let us know! Hi Anna, white whole wheat flour should be fine in this recipe. I would substitute it 1:1 for the all purpose flour. Hi Kristen, I would check them at around 15 minutes. They should spring back when gently pressed and look “set”. Hi – can I used melted butter instead of oil? Or – if use oil could i use grapeseed oil? Laura, yes, grapeseed oil would be fine here. And I don’t see any reason to not use melted butter—it should work fine, too. Nods. The cocoa thing is complicated. I always have to double-check to make sure which is dutched and which not, so you’re not alone. Anyways, fingers crossed that you love these as much as everyone we know does! Let us know how it goes!